If you happen to have a big bagful of apples this autumn like I did, slice them up to make sweet, healthy, crispy snacks! Alternately, cube them to end up with raisin-like dried apple bits (which are delicious in cereal, oatmeal, or cookie or muffin recipes). Heat oven to 150F (70C) -- basically the first notch on the dial, the lowest heat. Wash and core the apples (I used a vegetable peeler to cut and scoop out the core). Cut into slices about 1/2 cm thick. 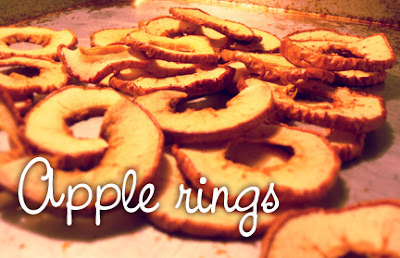 Spread in one layer on a large cookie sheet and dry in the oven for about 2-4 hours (less time for soft dried apple rings, more time for dry crispy rings). Halfway through baking time, flip the apples and turn the pan for even heat. 4 apples dried into rings fills a sandwich-sized ziplock bag. Store refrigerated in an closed container, or leave out to continue drying if consumed within a few days. The recipe says to bake at 150. Is that F or C?